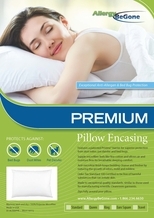 Pristine PREMIUM Allergen Proof Standard Pillow Cover 21" x 27"
Pristine pillow covers, easily help keep potentially harmful allergens such as dust mites and pet dander off of bedding and therefore away from the body. 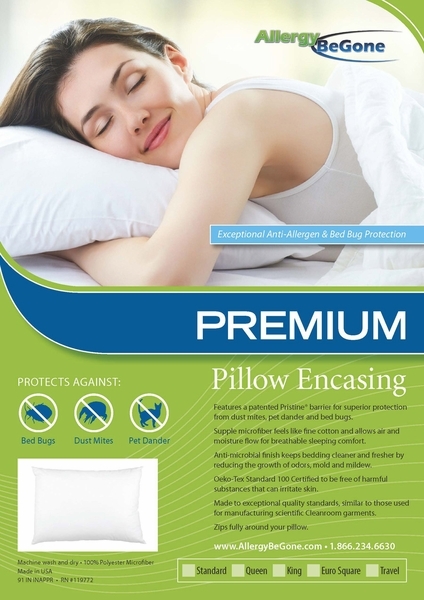 Our high-end pillow encasings are produced with just a 2 micron pore size, blocking 100 percent of fine allergen particles. Imperceptible when using, the made in the U.S. Pristine PREMIUM covers can even be machine washed and dried. This luxuriously soft and supple microfiber is the newest generation in allergen barriers. Air and perspiration porous, Pristine PREMIUM provides a new level of comfort. Microfiber fabrics are so thin and yarns so tightly woven that there is no space between the weave of the yarns large enough to allow the passage of allergens or bed bugs. Unlike vinyl encasings, our Pristine PREMIUM encasings are truly breathable, that is, both air and water vapor can pass freely through the fabric, even though allergen cannot. They are therefore extremely comfortable, actually imperceptible in use. Microscope photos have shown that many of the competitive products are much less tightly woven than the Pristine PREMIUM fabric. In many cases, the pores in those fabrics are more than large enough to allow the passage of allergens. This is not the case with Pristine PREMIUM - the pores in this fabric are small enough to block almost all common household allergens.